These ain’t the chile rellenos you get at cheapy, corporate Mexican(ish) places all over the country. 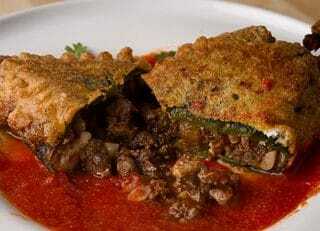 It’s a real-deal chiles relleno de picadillo recipe that will knock your socks off. It’s based off an Oaxacan version of the Puebla classic I found in Rick Bayless’ book Authentic Mexican. But instead of a regular picadillo filling, I used dove meat. Doves? Yep. Here’s the story behind this dish. 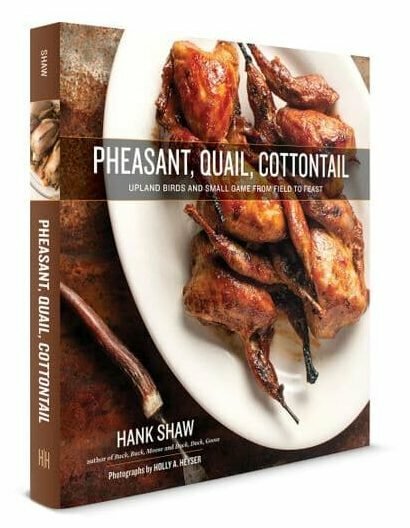 Holly and I were hunting doves on the opener in Yuma, Arizona this year, and we soon learned that the whole town gets really psyched about the beginning of dove season, to the point where several restaurants will cook your doves for you. The one we went to was Chretin’s Restaurant & Cantina, and they served us a borderline grotesque version of a popper that had the jalapeno, dove, cheese and bacon entombed in a thick batter. Odd, dirty, yet strangely good for at least a couple bites. Driving home, Holly and I thought about the place poppers have in dove lore. It’s what you eat on Opening Day, a tradition almost as strong as turkey on Thanksgiving. 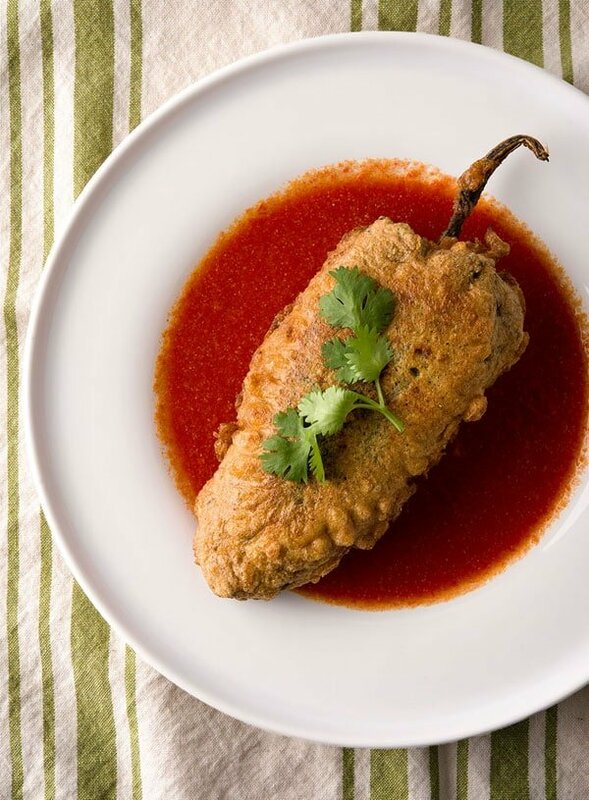 We were rolling around ideas when Holly noted that a chile relleno is in many ways a lot like a popper, only nicer. And indeed, this is most definitely not a popper, but it has a lot of the same flavors going on — and I can 100 percent assure you it’s worth the effort to make these. You have the dove picadillo, which in Oaxaca has almonds and raisins (according to Bayless) but which I made all Arizona by substituting local dates and native pine nuts. Do this if you can, as it’s way better than raisins and almonds. The result is sweet-savory, with lots of texture. You got your cheese and your chile, too, and I suppose you could add chopped bacon into the poblano to get the full effect. But I like this chile relleno as it is. Everything about this dish sings Southwest, which is where it’s at when it comes to dove season. No matter where you are, no matter what meat you have lying around, give this a go some weekend. Just make a couple more than you think you need: They’ll get eaten. I’m not going to lie: Making chiles rellenos isn’t a quick process. But nor is it overly difficult. And some of the steps can be done a day or two in advance. My advice is to make a big batch of the filling — double or triple this recipe — and freeze it in recipe-sized portions. You can’t really roast the poblanos too far in advance or they’ll lose their integrity, but you can do them up to 3 days in advance. You have options with this recipe. First, chiles. My pick is the poblano, traditional and easily obtainable in most supermarkets. You can use a regular green bell pepper. As for the meat, I used dove because I wanted to make this dish a hat tip to the Desert Southwest, where we were hunting doves. But you can use any meat whatsoever. Most chiles rellenos recipes use a melty cheese, and that's perfectly fine. And I thought I'd bought one, but as it happens, the cheese only partially melted. It was a happy accident. I liked how the queso para frier held its shape and added texture to the dish. Don't mess with the batter, however. It is what you want when you make a relleno: Light, airy, not greasy at all. Make the filling first. Put the dove meat and the onions and garlic in a food processor and pulse it a few times, just to get a kinda-sorta rough grind. You could also chop everything by hand. Put the meat, onions and garlic into a frying pan with the lard and brown them over medium-high heat for 5 minutes or so. Add the tomato puree, spices and salt and bring to a simmer. Simmer for 10 minutes, then add the pine nuts and chopped dates. Cook until the filling becomes a cohesive mass, about 10 minutes. Turn off the heat. Make the sauce. Buzz the chiles, onion and garlic in a blender, adding the sauce to combine. Heat the lard in a saute pan over medium-high heat until it's hot, then pour in the sauce. It will spatter, but stir it vigorously for a minute or two, then turn the heat down. Add salt to taste and turn the heat to its lowest setting. Char the skins of the poblanos over a gas burner if you have one. This is the best method because it doesn't cook the peppers too much. If you don't have a gas range, use a grill or a broiler. When the skins are all blackened, put the peppers in a closed environment -- a bag, a bowl with a lid, etc. -- and let them sit for 20 minutes before wiping the skins off with your fingers. Try not to use water to do this, as it will rinse away some of the flavor of the chile. Now make a slit in each chile from the top to about 1 inch from the bottom. Carefully remove the seeds (you may need a paring knife to cut the seed ball out) and flush the seeds out of the inside of the pepper with running water; yes, this saps some flavor, but it beats picking out every damn seed by hand. To make the batter, beat the egg whites with the salt until they just begin to hold a peak. Beat in one egg yolk at a time, then add a tablespoon or two of flour. Set aside. Get your oil going. You want it to reach 1 inch up the side of your pot, and you want it to hit 375°F. This will take a bit of time. While the oil is heating, stuff your peppers. Lay some cheese into each pepper and then stuff the filling into them. Keep in mind you will need to reclose each pepper, so don't overfill. Dust each pepper in the flour, then, when your oil is ready, coat with the batter. Lay a pepper or two in the hot oil seam side up. Fry until golden brown, about 3 minutes. Carefully turn and fry the seam side another 3 or 4 minutes. If you can't get all the peppers fried quickly, set the finished ones on paper towels in a baking sheet, and put the baking sheet in an oven set to "warm." To finish, pour some sauce on everyone's plate and top with a relleno. Garnish with cilantro if you'd like. Serve these by themselves or with Mexican rice, along with lots of cold beer. Any suggestions on using gator meat for this? Andy: Huh. I bet it would work fine. Dice it small.